I did this last year and you can read about it HERE. I really enjoyed having these posts to look back on the following year to see any differences and improvements and such. This year was plagued by 2 injuries. 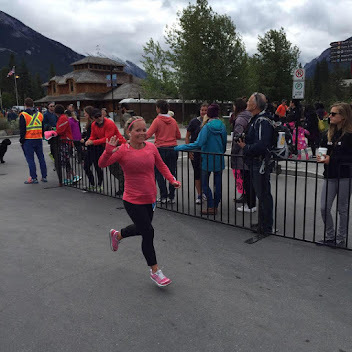 A weak hip in May caused me to miss a lot of running and not register for the Calgary Marathon. A sprained ankle in September and is still causing problems for me today as I write this. Despite this, I had a few stellar months and had I not sprained my ankle I would have destroyed my previous years KM total. This year, I had 2 running watches again. Greg lost my Garmin Forerunner 220 and I replaced it with the new Apple Series 2 Nike Plus watch. I loved my 220 but I am happy with my Apple Watch too. I wore 3 pairs of Intuition 2.0's which is quite high. My first pair were retired in May and I switched to the second pair which I wore until September 1st and then switched to my current pair. The middle pair I am convinced are jinxed because they caused me all kinds of foot issues that I have never had before. Greg thinks it wasn't my shoes but once you get it in your head that it is, the shoes are as good as gone. They are now bootcamp shoes. I ran 2 half marathons. One was on June 19th and was in Banff. I finished in 2:31:11. The other was in Vancouver on August 13th and I finished in 2:30:28. I wasn't overly pleased with either finish but it is what it is. I was registered for the Harvest Half Marathon on October 1st but I had to sell my spot after I sprained my ankle on September 4th hiking in Banff. I started out the year with no KT Tape anywhere but after my hip problems caused problems everywhere else I started taping my knee again. I also continued to wear my IT Band Strap too but I thanks to a sprained ankle that curbed all activity for a long time, everything healed and I am currently running with 0 tape or bands. THIS IS HUGE!!! I ran 97 out of 365 days which is up 7 days from 2015. I ran a total of 593.68km down 50.03km from 2015. In 2015 the most km ran in a month was 99.78 in July. I broke that record in June with 102.85 and then broke that record in July with 117.82km run. You can certainly tell when I was hurt (May and September and part of October). November just had my trip to California and took me awhile to recover hahaha. I also ran my furthest distance ever with a 22.03km run on July 30th. So overall I think I did ok given the injury situation. My goal for 2017 is to stay injury free and beat both 2015 and 2016 for the amount of KM. My goal will be 700km which I think if I stay healthy should be doable.